Ok so I'm probably clutching at straws. Throughout the whole of iD (I've only seen the anime) it is shown that Bunta has connections. What if it goes deeper than him just having connections. Something I briefly mentioned in a fan fic I'm still writing is that Bunta is a development driver for Toyota. Seems far fetched yes, but it would explain a lot. The engine that he put in the 86,not just something you could get easily. So my theory is, Bunta is a development driver for at least Toyota. Best of luck with your fanfic. There is precisely nothing provided within Initial D to either support or debunk this idea. You can have the Bunta in your story be a Toyota test driver or a JAXA astronaut or an ex-Konami employee who became persona-non-grata after quitting Konami but saved up tons of cash, and it'll all work. But what actually led to his connections in Initial D proper will never be known unless Shigeno answers the question himself. Bunta used to be a yakuza kingpin. Forced induction means turbocharger or supercharger. The 86 has neither of those. Ignoring the plainly incorrect statements Meteor already touched on, got any sources for your "common facts?" I just want to know how he got an engine like that. I'm going to bite on this too... I'm going to go ahead and say that you've got that turned around, boss. Tsuchiya, when stating a curiosity in Takumi's drifting, tells Bunta that he was scarred by his drifting in years past. While this isn't always true, generally the better driver will have the better setup car, as learning the two tend to go hand-in-hand. We see Bunta doing his own suspension tuning in Second Stage to handle the new engine, so I have doubts that he needs much help from outside sources. Plenty of ways, but typically that kind of stuff hits the market through auctions. Shops or race teams will close or go out of business every so often, and they'll either sell assets to stay in the black, or have them auctioned off under bankruptcy, etc. The Skip Barber school recently went under and everything was sold at auction, including their open wheel stuff. I think you are confusing reality with fiction here. Just because Tsuchiya-san might have the same setup in his 86 in real life doesn't mean he helped Bunta in Initial D. At no point in the story did it ever hinted that Bunta received help from Tsuchiya-san. Image size reduced, original size: 732 x 470. Click here to view the image in its original dimension. Not to mention the poor grasp of the English language makes me think that this 'source' is in fact self-referential. 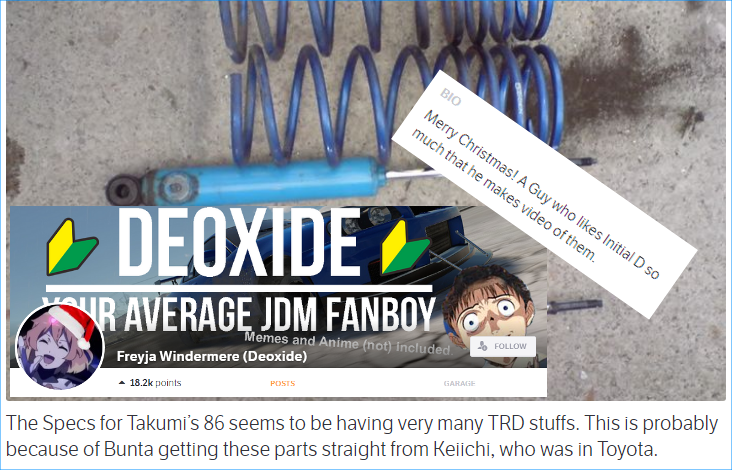 I just realized that @Racer4WD doesn't seem to know that Tsuchiya-san is the technical consultant for Initial D. It's not a surprise that the 86 in the anime will have settings somewhat close to Tsuchiya-san's 86. It makes it easier to try out some of the techniques if the 86 in Initial D is based on a real life 86. That's where reality bridges into fiction. Bunta is a fictional character, the purpose of having a real life person, Tsuchiya's cameo phone call, was to acknowledge Bunta's legendary status. It doesn't say anything about Tsuchiya helping Bunta getting those parts. Could the Tsuchiya-san in the story helped Bunta in getting those parts? Absolutely. But did the story says so? No. The author, Shigeno Shuichi, is God when it comes to Initial D. His words are the truth and the only truth. He did not say anything about Tsuchiya-san helping Bunta and you have to accept that. That source reads like cancer. The problem is that you tried to claim that your 'fan theory' is a 'common fact'. Sorry kiddo, but those two things are mutually exclusive until hard evidence surfaces to prove otherwise. Theories are accepted as true when evidence surfaces to support them as such. Pretty simple. Hey, you know something? That sounds like a really interesting fanfic! In the story, if Tsuchiya is friends with Bunta, I'm sure he has seen Bunta's true driving skills before. That means they ran into each other on the mountain pass. Maybe a chance meeting that bloomed into friendship. If they met on the touge, I'm SURE Bunta would have been tempted to turn it into a full blown race against a top opponent of Tsuchiya's caliber. Or at least a semi-serious race like when Ryosuke drove at 80% ability vs Nakazato. If Shigeno revisits Initial D, with a prequel or something, it would be cool if they had a race between Tsuchiya and Bunta. Shigeno could just end the race prematurely because of oncoming traffic, or just have that 80% ability race for fun, with the result being a tie.